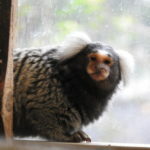 Coco was born in 2015, bred specifically to be sold into the primate pet trade. 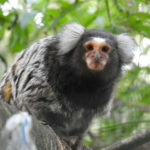 He arrived at the Monkey Sanctuary in March 2017 with his companion Kiki; the first marmosets that the Monkey Sanctuary ever rescued! Coco had been kept as a pet in a house in Wales for two years, and for the first year of his life he was kept alone before his owners bought Kiki to keep him company. Because of this time spent alone, Coco is not as confident and doesn’t always handle social situations correctly, but Kiki is there to give him a firm telling off if he steps out of line! 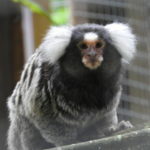 Kiki was born in 2016, and was sold at a very young age into the primate pet trade. She was kept as a pet in Wales for a year, along with her companion Coco, before arriving at the Monkey Sanctuary in March 2017. 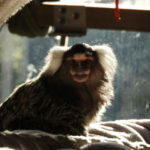 At just one year old, Kiki is a very young and excitable monkey, but also very intelligent, and she is often showing Coco how to be a monkey. She is very good at solving puzzles, meaning she gets a treat much quicker than Coco does, and she always knows when her carers are there to give her something tasty! Indie is an elderly female who had been kept alone and in a small bird cage for her entire 8 years as a pet. Confiscated by the RSPCA she made the long journey from London to Cornwall to begin her new life here at the Monkey Sanctuary. Initially she struggled to move around on the ropes and branches, but her determined nature meant that she wouldn’t give up and before long she became very agile! She moved in with Jerry, who had also been kept alone as a pet, and the two were able to build their social skills together. They now enjoy sunbathing together in the sunshine!